Welcome to our Hotel in the middle of the Amsterdam canal belt, very close to Prinsengracht and Reguliersgracht. Have a relaxing evening at our Boutique bar with a cocktail on comfortable fauteuils and enjoy the view on distinctive Amsterdam houses. 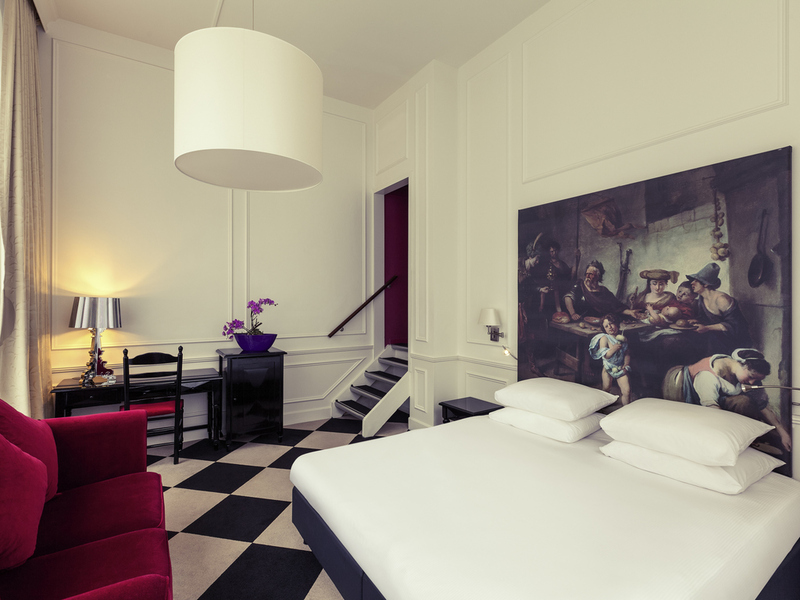 Located within the Amsterdam Canal district, the hotel is the perfect place to enjoy Amsterdam's historic city centre. The hotel is at walking distance of Amsterdam's most iconic museums, such as the Rijksmuseum, Van Gogh Museum and Anne Frank House. With the Metro 52 around the corner (Stop Vijzelgracht) we have a direct connection to Amsterdam Central, Dam square and the RAI conference centre. We are here to make your stay enjoyable, whether for business or pleasure! And we hope to see you soon. All Amsterdam's highlights are within walking distance. The major museums - Rijksmuseum, Van Gogh Museum, and Anne Frank House - are just around the corner. Other attractions, such as the Heineken Experience, are easily reached by foot or public transport The hotel is ideally located for bicycle or boat trips in Amsterdam's city centre. The other parts of Amsterdam can easily be reached by means of public transport. RAI Convention Centre is only 6 minutes away by Metro 52. Amsterdam is perfect for a weekend long city trip. There are many shops, restaurants, museum and other attractions to enjoy. Mercure Centre Canal District is centrally located in Amsterdam's city centre and is the perfect base to explore the city. Payments can only be done by credit or debit card (debit card only at check-in). We do not allow cash payments. Choose the room that meets your requirements from the room categories on offer. Select from our range of comfortable Standard rooms with a view out over the traditional Amsterdam houses. MyRoom by Ed: Learn to bike like a local. Bring your day to a perfect end with a drink in one of the relaxing armchairs in the bar. The barman will mix you the cocktail of the day every day from 5 pm. Generally happy about my stay as it was very close, i.e. walking distance to 'De Bazel' where I attended a conference. The room was in the cellar, but had everything it needed. Maybe it would have been nice to have had a room above ground level for that price. I would appreciate to be notified next time if the room is in the cellar as it would be depressing if one had to work for several hours (what I sometimes have to do) in that room without real daylight. The breakfast (also in the cellar) was more than OK. Administration-wise, It would have been nice if the hotel could have generated two separate invoices as I needed to split the bill with a colleague; however, that did not seem possible, generating additional administration on my side now. The hotel is well placed and the service is efficient. The rooms are a bit an effect of the old building - not small but not well planned. The shower could be bigger and the cushions softer and lower. Great location, really friendly and helpful staff and fabulous breakfast.....only negative was small window and we were told it would be more luxurious. I’ve stayed at the Mercure Canal District several times in the last year and always been entirely happy with it. This time I had a room where the street noise was. Was so loud I actually stayed with a colleague for one night of my four to get done sleep. Perfect 3 night stay for business travel. Lovely hotel with super friendly staff. Convenient to public transport. Spacious room for 3 of us. Cery comfy beds. Lovely hotel with friendly courteous staff. The room was interesting with huge windows and high ceilings. Clean and good bathroom. Nice to have coffee maker and kettle to make tea. The bed was extremely comfortable with nice furniture in the room. The hotel looks nice and clean. The personnel is welcoming and very polite. The room was very small. A lot of noise in the corridors during the night. Insulation between rooms could be better as well. The heater is doing a lot of noise (knocking). No bottle of water inside the room. Location of the hotel is really an asset. Price is very expensive for the quality of the room. We received a lovely welcome from Megan when we arrived but would have been helpful to know food was available in the bar as it was late when we arrived. The hotel is very well located so would stay again based on this aswell as the breakfast (although it is expensive). The only downside was the room could have been a bit cleaner and is in need of a bit of redecoration. The shower was a bit odd with the concrete floor - a bit hostel like and also nowhere to put your shower gel etc. Also, proper mugs in the room would be so much better rather than papercups. Mini fridge was very welcome though as was getting BBC1 on the TV. All in all a good stay. Excellent service very informative staff told us some excellent off beaten track thingto see places to eat. Beautiful breakfast set us up for day . Location for us perfect . Hotel was very central, nice, clean and good breakfast. Though a Bathroom was freezing-cold early April, would be nice with floorheating or at least some heating element. Some additional space to hang towels and improve water pressure in the shower would lift the room a level up. Staff were excellent - friendly and helpful. The breakfasts were good. The room was not so good despite being a Privilege room. I booked the room because it is more spacious, not because we wanted a Nespresso machine or fluffy bathrobes (neither of which we used). Although the room was more spacious the space was not useful. The hanging space in the wardrobe was barely adequate and there was very little drawer space or space to store toiletries either in the bedroom or bathroom. The bedside 'tables' were small tacky looking see-through plastic with insufficient space for books, water etc. The chairs were also see-through plastic and were not comfortable. There was very little room to access the bed on the window side and my husband had to shuffle sideways when getting in and out of bed. The heating pipes made a knocking noise late at night and from 5am most mornings. The staff was kind and the breakfast was good. Comfortable hotel, lovely helpful staff and a great location. From check-in to check- out the staff couldn’t have been more helpful. Very good breakfast choice and a nice bar to relax in after a full day in the city. Rooms quite small but more than adequate for a single occupancy but wouldn’t like for double occupancy. Everything else was first class.